Microsoft Security Essentials is one of the best free anti-virus software programs on the market today. Other free antivirus programs include panda Cloud, AVG, and Avira. We take a look at Microsoft's free program and how it stacks up to other anti-virus and security programs. Before we delve into the facts, let's see why an anti-virus program that is in the same category as great security software programs such as Norton, McAfee, BitDefender, and Kaspersky, is free of charge. The answer is simple. Microsoft intends to encourage users, especially in places like China, India, and other countries where a majority of computers run on fake Windows Operating Systems, to buy the original Windows software. Microsoft is hoping that a lot of these users are willing to buy the genuine Windows in order to get the free anti-virus, along with a few other nice features. The User Interface is quite simple and very easy to use. Microsoft Security Essentials fits right in with the design of Windows. Like other anti-virus programs, you can conduct full, quick, or custom scans. A few unique features are that you can exclude computer processes, scan removable drives, and set Microsoft Security Essentials to create restore points every day before cleaning. All these and many more tweaks are possible via the settings. 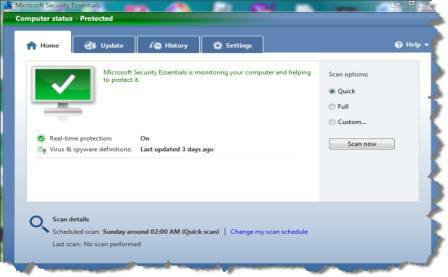 Microsoft Security Essentials protects against viruses, Trojan horses, spyware, and other malicious threats that are dangerous to the computer. Other free security software programs can be like bait. They have some functions stripped off to entice users to later upgrade to the paid versions. To use Microsoft Security Essentials, you must have the genuine Microsoft Windows operating system. This is the only catch if you would even call this a catch. Microsoft Security Essentials is one of the best, if not the best, free anti-virus programs. Other paid security software will still do a better job in some cases. Some anti-virus programs like Norton 360 do a better job in terms of protecting and optimizing computers than MSE. BitDefender, for example, lets you know when an application or process is trying to access the Internet, which can be helpful when trying to identify threats. MSE, however, will still do a great overall job keeping your PC safe.